Spano Pole Refuge is located in the southern part of Malko Spano Pole cirque in the northern part of Pirin mountain. The refuge sits at 6740 ft (2055 m) above sea level right under the southwestern slopes of Bashliiski Chukar peak. The refuge itself consists of a cluster of 10 two-person bungalows. The site has electricity due to its own hydroelectric generator. It has running water and outdoor bathrooms. The refuge is also known by the name Gubkite. Gubkite (Bulgarian for mushrooms) comes from the fact that the roofs of the bungalows are metal, with large white spots on a red background. During the summer months, additional tents are erected near the bungalows, to provide another 12-14 beds for visitors. A dining room and small kiosk provide food for tourists. The town of Sandanski is the starting point for Spano Pole. There is an 11 mi (18 km) asphalt road from the resort town to Popina Luka, leading toward Yane Sandanski Hut and from there toward the refuge. 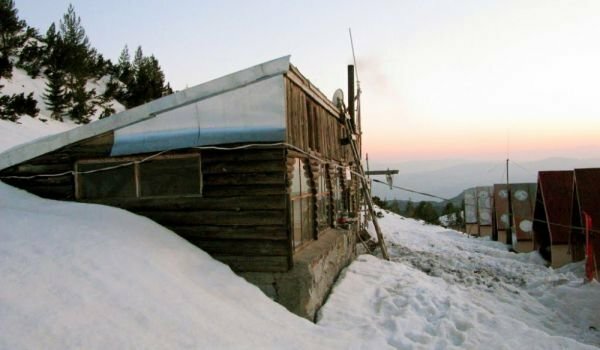 - Yane Sandanski Hut - Spano Pole Refuge - this hike takes about 3.5 hours. The trail goes along a yellow-marked path toward Vihren Hut. At the Golyamo Spano cirque, the path crosses that coming from Peshterite - toward Sinanitsa Hut and Begovitsa Hut. Follow the trail in the direction of Begovitsa Hut and after about 30 min. of hiking you should arrive at the refuge. - Vihren Hut - Spano Pole Refuge - this route takes about 3 hours. Follow the marked trail in the direction toward Yane Sandanski Hut. At the crossroads with the route from Sinanitsa Hut, make a left toward Sinanitsa Hut and after 20 min. you should arrive at Spano Pole Refuge. - Sinanitsa Hut - Spano Pole Refuge - this is the shortest route, taking about 1.5 hours. 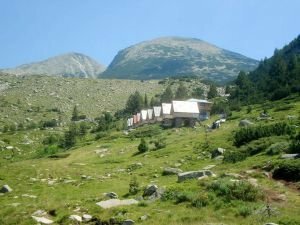 Hike along the brown-marked trail from Begovitsa Hut and Pirin Hut. - Tevno Ezero Refuge - Spano Pole Refuge - it is a 3-hour hike between the 2 refuges along the red-marked ridge trail toward Vihren Hut. At Prevala, make a left and head off the mountain ridge trail along the green-marked path toward Chaira cirque, Bashliitsa region. Once you get to and cross Bashliitsa river, hike along the brown-marked path toward Sinanitsa Hut and once at Peshterata region, make a right toward Sinanitsa Hut itself and keep going until you reach the refuge. You can use Spano Pole Refuge as a starting point for short hikes to Bashliiski Chukar peak - 90 min., Bandereshki Chukar peak - 120 min., Spanopolski Chukar peak - 90 min. or to Malko Stanopolsko Lake - 60 min.